Over the Christmas holidays, I met up with my parents in Honolulu, where we rented an apartment in Diamond Head for about two weeks. I definitely enjoyed staying in an apartment more than a hotel, as we were able to cook and make ourselves 'at home'. I thought I'd compose some quick tips and suggestions as I have been to Oahu several times now and think I have found some great spots to eat, visit and see. I added some pictures from my trip as well. Enjoy! 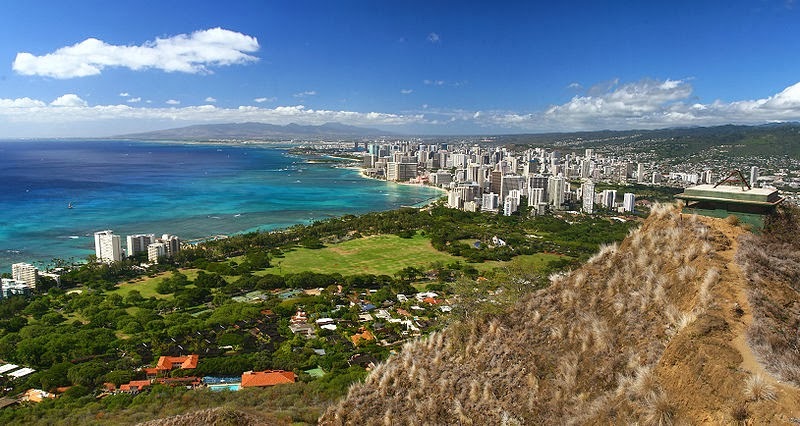 Firstly, let me say that it is SUPER important to get around the island of Oahu, rather than just staying in Honolulu or Waikiki and walking around. Getting a rental car to drive around the island would be ideal but if your budget does not allow, the public bus system is fantastic, easy to navigate and cheap. If you don't get out of Honolulu or Waikiki, you will really miss out on the beauty outside of the city. My absolute favorite beach on the island is Lanikai. It takes about 30 minutes to drive to it from Waikiki. I have taken the bus before and that takes about an hour. You can get off the bus at Kailua and walk to Lanikai. The beach is one of the most beautiful I've ever been to. Clear water, soft sand and an incredible view of the two islands, Na Mokulua. 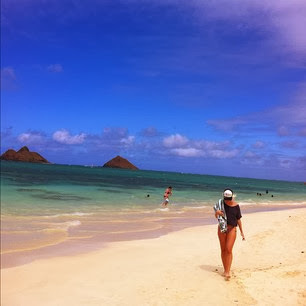 An extra tip would be to visit Lanikai during the week when it is less busy. There are some really interesting, unexpectedly good places to eat in Oahu. I'm going to break it down by meal-time and tell you some of my favorites. For breakfast: Visit the North Shore and the town of Haleiwa. You will find a local "shack" called Haleiwa Bowls serving Acai bowls which are a blend of acai (berry) sorbet, granola, bananas, coconut flakes and honey. Absolutely delicious (and healthy). It takes about an hour to drive to the North Shore, but the drive has dramatic views and there is plenty to see and do once you get there, including checking out some of the beaches frequented by pro surfers that have gigantic waves. For lunch or a snack: Visit Leonard's Bakery, about two miles from Waikiki. At this bakery you will find the most delicious pastry in the universe: the malasada. Traditionally a Portugese dish, malasadas are egg-sized balls of yeast dough that are deep-fried in oil and coated with granulated sugar. I found myself going back for more every single day of my trip- they were THAT good! This bakery has been running since 1952, a testament to its success. Finally, for dinner: Visit Prima in Kailua. Incredible pizza, incredible pasta, with an emphasis on sourcing local, sustainable ingredients. We had fantastic service here and would not have found it without a recommendation from a friend, as it is in a smaller town and looks very modest from the outside. I would advise to stay away from shopping in Oahu, mainly because there is so much natural beauty and other things worth doing. However I will mention a bikini store called San Lorenzo, which has several locations across the island. Their swimsuits are made in Peru and Brazil and are very unique and flattering. You can also customize tops and bottoms to ensure the right fit and color selection to your liking. An interesting day trip my mother planned was visiting Doris Duke's old home, Shangri La. The Honolulu Museum of Art organizes tours of the home, as it has become almost a museum of Islamic art. Our tour guide was extremely knowledgeable on the art forms in the home and it was fascinating learning about how it was built and designed. On top of the educational experience, the home has a jaw-dropping view of some of Oahu's coast and a flawless garden and pool. After eating a few too many malasadas, a walk to the top of Diamond Head volcano is a must. It takes about an hour but the view over the island from the top makes it well worth it. Hawaii is truly one of my favorite places on earth. It has so much history, culture, beauty and warmth. I plan to go back as many times as I can and see more. One thing I deeply value is the Hawaiian promotion of respect for the environment and the highlighting of local business and produce. Although tourism has benefited the economy, I'm sure it has undoubtedly threatened the environment and preservation of native culture. However, Hawaii seems to be making efforts to sustain what is really important and I noticed it more this time visiting. Our Favourite Grammy Looks !